Will Pluto Get Its Planethood Back? Pluto as seen by NASA's New Horizons probe during its epic flyby of the faraway world in July 2015. Advocates of Pluto's planethood are about to fire another salvo in the decade-long debate about the famous object's status. Scientists on NASA's New Horizons mission, which performed the first-ever flyby of Pluto in July 2015, will officially propose a new definition of "planet" next month, at the 48th Lunar and Planetary Science Conference in The Woodlands, Texas. Pluto failed to meet this last criterion, because its neighborhood — the vast Kuiper Belt beyond Neptune's orbit — is full of small, icy objects. 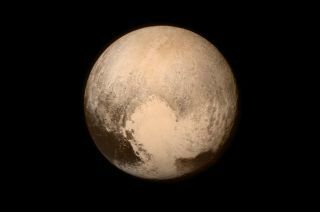 So Pluto was stripped of the planethood it had enjoyed since its 1930 discovery, and was reclassified as a dwarf planet. "First, it recognizes as planets only those objects orbiting our sun, not those orbiting other stars or orbiting freely in the galaxy as 'rogue planets,'" the researchers, led by K.D. Runyon of Johns Hopkins University in Baltimore, wrote in the paper, which you can read here. "Second, it requires zone clearing, which no planet in our solar system can satisfy since new small bodies are constantly injected into planet-crossing orbits, like NEOs [near-Earth objects] near Earth. Finally, and most severely, by requiring zone clearing, the mathematics of the definition are distance-dependent, requiring progressively larger objects in each successive zone. For example, even an Earth-sized object in the Kuiper Belt would not clear its zone." Pluto would regain its planethood under this new definition, and a lot of other bodies would be viewed as planets for the first time — including Earth's moon (and any other moon large enough to be spherical, such as the Jovian satellite Europa). Indeed, the number of officially recognized planets would balloon from eight to about 110, the researchers wrote. But that's OK, they added; there's no rule stating that schoolchildren must be able to memorize all the planets. And swelling the planet ranks would better convey the exciting diversity found throughout the solar system, the team members wrote. "This definition highlights to the general public and policymakers the many fascinating worlds in our solar system that remain unexplored and are worthy of our exploration, along with the necessary budgets," they wrote. But not everyone is clamoring for Pluto to be reclassified. One person who's quite happy with the status quo is Mike Brown, an astronomer at the California Institute of Technology in Pasadena. Brown and his team have discovered many objects in the outer solar system, showing that Pluto is far from the only large object in the Kuiper Belt. This growing realization seems to have spurred the IAU to draft its 2006 definition; indeed, Brown chose "@plutokiller" for his Twitter handle. So what does Brown think about the proposed new definition? You be the judge. "Oh god the stupid Pluto stories are back. Yes, someone has proposed making Pluto a planet again. No, nothing is changed or new," Brown tweeted Tuesday (Feb. 21). "Also, I should note, that proposal would make the moon a planet. Which is about 500 years out of date. But, ok #MakeTheMoonGreatAgain," he added in another tweet. The 48th Lunar and Planetary Science Conference runs from March 20 through March 24. It should be lively!